About 30 minutes into the grueling match between champion Kazuchika Okada and Katsuyori Shibata at New Japan's Sakura Genesis on April 9, viewers saw one of the nastier things to happen in recent pro wrestling history. Shibata shrugged off a stiff Rainmaker clothesline from Okada, looked at him, and full-on headbutt him, forehead to forehead. There was a sincerely sickening wet thud, like a ripe melon falling on the floor. Okada went down, while Shibata stood there, stunned, before a thin trickle of blood mixed with sweat ran down the middle of his face. Okada, as it turns out, was fine, and the two men finished the match, but Shibata had suffered a subdural hematoma—a burst blood vessel and pooling of blood in the brain. 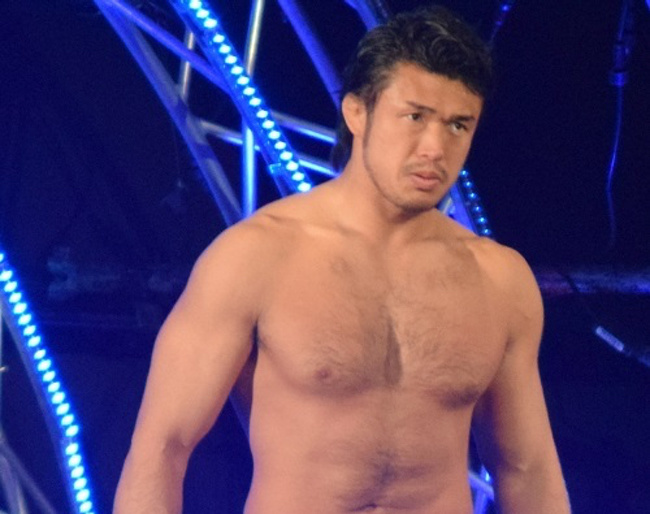 Shibata was rushed to the hospital after collapsing backstage post-match. Now reports this week say that the 37-year-old may never wrestle again. The headbutt overshadows what was otherwise a truly great match. The match was a classic of Japanese strong style—a brutal style of pro wrestling that relies on barely pulled strikes and quasi-legitimate submission holds, with a special emphasis on "fighting spirit," or the ability to take all of it and still win. You end up with masochistic back-and-forth of striking and grappling, with the loudest pops reserved for the wrestler who takes it and still comes back. Done correctly, it's one of the greatest spectacles in pro wrestling. The headbutt, however, crossed a line into real—and unnecessary—violence. The ways in which Japanese wrestling pushes physical limits are very different than the ways American wrestling does. We like our big spots here, moments of brilliance, daring, and more than a little stupidity. When it's time for ultraviolence, we crave deathmatches with light tubes and ladders (Japan, it has to be said, has always had a thriving deathmatch scene, too). Strong style is something else entirely. Bodies become weapons in a uniquely violent dance and people hurt each other. It's impossible to convey the legitimate danger strong style trucks in to skeptics who think of pro wrestling as "merely" a series of stunts performed by fake devil worshipers and middle-aged businessmen. That has to be planned, the skeptic says. There have to be safety measures. Chair shots go to the flat of the back to mitigate the impact, there's a mat outside the ring. All smoke and mirrors, they scoff. And where the skeptic says it can't be true, the fan says it's true but. But it's their choice. But I never wanted Daniel Bryan to retire even though I cheered every headbutt. But they went out on their terms. We can distance ourselves from our role as participant in pro wrestling's blend of simulated and real violence. Strong style strips away all of that, leaving us with no distance. The illusion that nobody really gets hurt goes out the window in matches like the one between Okada and Shibata. They really do just pound each other. There's something far more visceral and immediate about violence without the distance created by chairs and gimmicked tables, too—I cannot imagine myself jumping off a ladder or hitting someone with a chair, but I can definitely imagine getting my head kicked in by an angry person. Shibata, more than anyone, is a master of this stuff. He's got a mean streak that crosses language barriers and is apparent in the ring. He's stiff, but he also clearly has no issues with taking as much as he gives out. A good friend of mine said she detested Shibata for working too stiffly with other wrestlers and that she's never enjoyed watching someone get legitimately hit like he does. Subdural hematomas don't just happen, but injuries like them (as opposed to the sadly routine concussions) have happened in several high-profile cases in Japan. A very quick perusal of a list of brain injuries in pro wrestling will match names, nationalities, and the type of injury we're talking about: bleeding on the brain, strokes, burst blood vessels, paralysis, and seizures. It's too much to say that strong style is definitely to blame, but the prevalence of such a specific type of brain injury in wrestlers working that style is enough to give pause. Shibata's injury, in the very immediate sense, is a black mark on a match that otherwise really was something special. More broadly, it's another sign that something has to shift or we're going to be seeing a wave of dead or disabled Japanese wrestlers to rival the awful list of American wrestlers a similar lack of oversight produced in the 1990s and 2000s. No pop or match rating is worth that headbutt. The fans were rabidly pro-Shibata before the headbutt happened. It didn't really do anything for the match in a dramatic or athletic sense. There's hard-hitting and then there's stupid; the headbutt definitely fell on the side of the stupid. WWE has screwed up a lot recently, but one thing they've taken an admirable lead on is curtailing the worst impulses of their wrestlers in the ring. It shouldn't have taken Chris Benoit's murder/suicide to bring stuff like chairshots to the head to a halt, but that's beside the point: they're banned now, and rightly so. We don't have a definitive list of what's been banned from WWE rings, but Shibata-style headbutts are undoubtedly on it. Many critics contend that the promotion is sometimes too cautious—blood is not the same thing as injury in wrestling, for instance, yet it's been banned—but that's far more preferable than the other way around. Pro wrestlers are not unique among athletes in putting their health at risk for the sake of their sport. Quarterbacks want to go back out after being concussed, soccer players want to test a twisted ankle or knee. Pro wrestlers want to make a slightly more dangerous jump or take just a little more physical punishment, all to blur that line between reality and illusion just a bit more. Can someone jump 30 feet down without getting hurt? Can people get up from full-force headbutts? It's up to management, in sports and in pro wrestling, to pump the brakes sometimes. Promoters and bookers have every financial incentive to look the other way when the next Shibata starts making a name by pushing the limit just a little more, but people are going to die if the edge isn't filed off just a bit. Even the King of Strong Style is asking for it to be toned down. Hopefully people will listen.